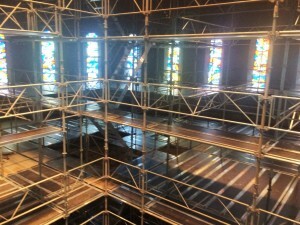 Scaffolding Solutions is a full-service scaffolding engineering firm that services the Washington DC, Virginia, and Carolinas with the design, erection, inspection, and maintenance of scaffolding systems. We serve a number of markets from commercial to government institutions with a track record of excellent safe service. Our company is committed to giving you a safe experience, from the erection to the dismantling of our scaffolding for your project. The Scaffolding Solutions commitment to excellence starts with the tools we use including our exclusive use of the Turner OCTO® scaffolding that our Washington, DC based team will deliver and oversee for the duration of your project. If your job requires a more durable and covered solution we also offer construction and containment tarps. Our products’ expert ability to shield and cover your worksite as well as keep out any debris or weather means you get more productivity and a better finished product. Often on the job our clients will need their own elevators to move people and materials to different places on the job site. 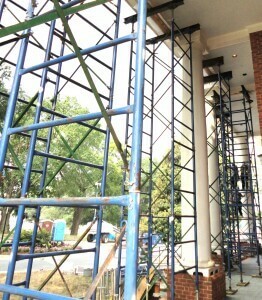 Scaffolding Solutions offers a variety of elevators and hoists to meet your needs. Come talk to us about your project and see if an elevator or hoist is necessary for you. Our professional and experienced team of engineers will get a detailed description of what you need and create a customized and safe shoring solution for your project using our industry standard Waco-style Hi-load shoring system. An often overlooked part of the construction site, trash chutes are imperative to a clean job. Scaffolding Solutions takes pride in supplying, designing, and installing trash chutes for everything from highrises to small structures. If you’re looking for a professional and safe scaffolding solution for your project in Washington, DC give us a call or email us and get a free quote.